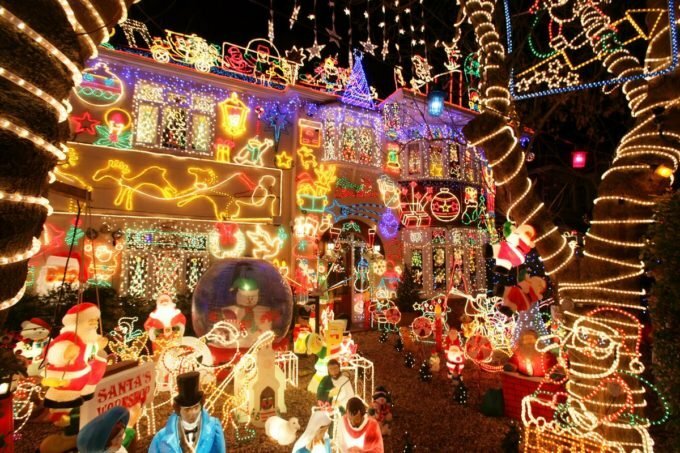 One of New York’s most jaw-dropping holiday displays is in Dyker Heights, Brooklyn, where dozens of family homes between 11th and 13th Avenues, from 83rd to 86th Streets, go ALL OUT with decorations (think: massive inflatable reindeer, entire houses draped with lights, and “Let It Snow” blasting from loudspeakers). It’s completely over the top in the best way, and makes for a lovely bundled-up winter walk. Insider tip: Warm up afterward with some of the most delicious Middle Eastern food city-wide, at Tanoreen in nearby Bay Ridge (order the Brussels sprouts with tahini! ), or visit Sunset Park, another adjacent neighborhood, for noodles in bubbling broth at Mister Hotpot. 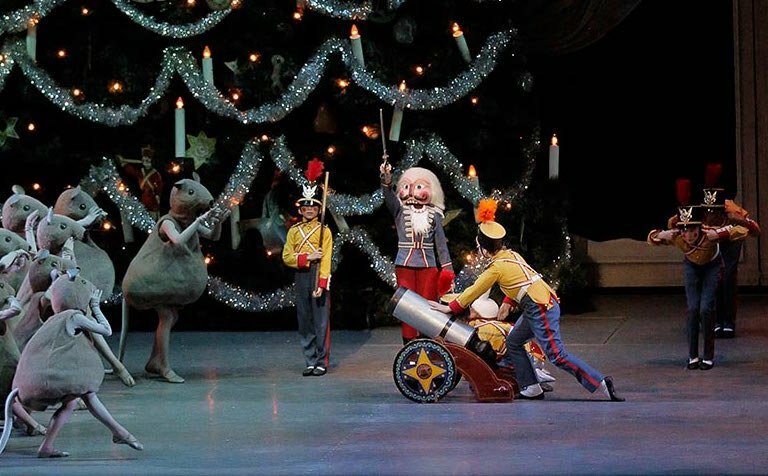 There’s no more classic holiday activity than a performance of the Nutcracker by the New York City Ballet. It’s magical even for adults, but the 2 p.m. matinee shows are well-timed for kids — and nothing is cuter than hearing the collective gasp at the Mouse King. Insider tip: If you’re hungry, order meatballs-with-a-cult-following at Parm, or pick up the best chocolate chip cookies in the city (the world?) at Levain Bakery or Jacques Torres. Guys, this is the REAL Santa! 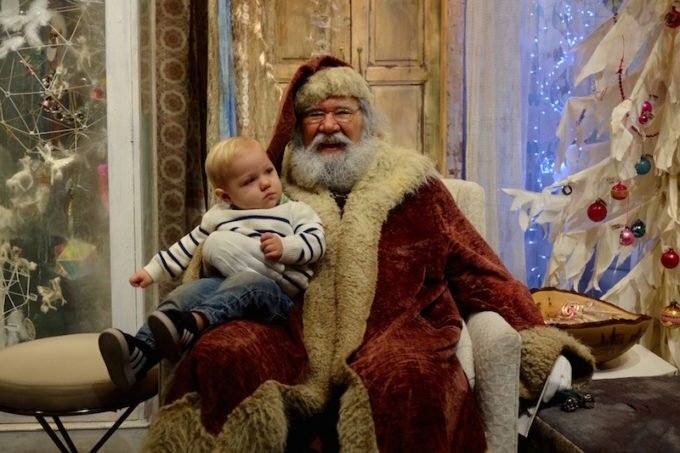 For 20 years, he has been parking his sleigh at the Flatiron store on weekends to the delight of one and all. You can catch him this year through December 17th. 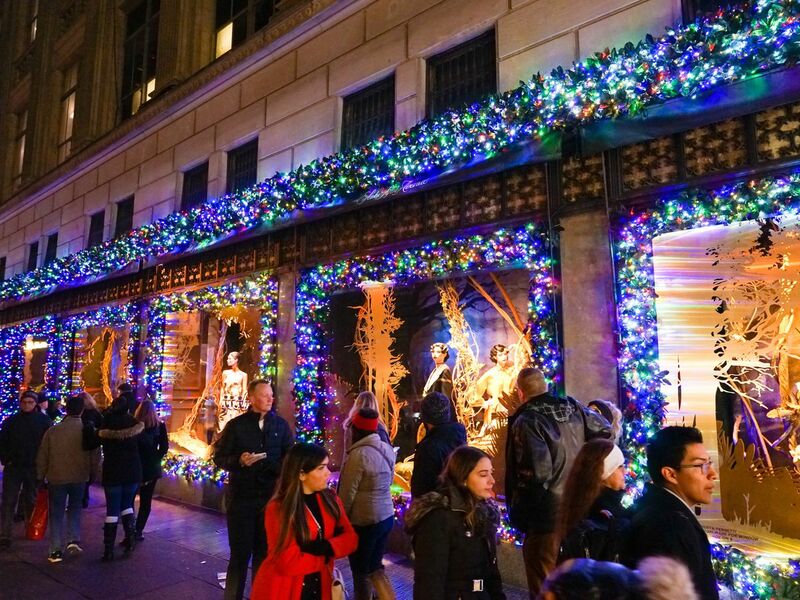 Manhattan’s biggest shopping district is crowded this time of year, but it’s worth strolling by the stunning window displays of the department stores — all of which pick a theme and REALLY run with it. (This year Bergdorf’s is “To New York With Love,” with Swarovski crystal-encrusted dinosaurs from the American Museum of Natural History.) One easy walk is to start at Saks Fifth Avenue, and then go past Henri Bendel, Tiffany’s, Bergdorf Goodman and finish at Barneys. 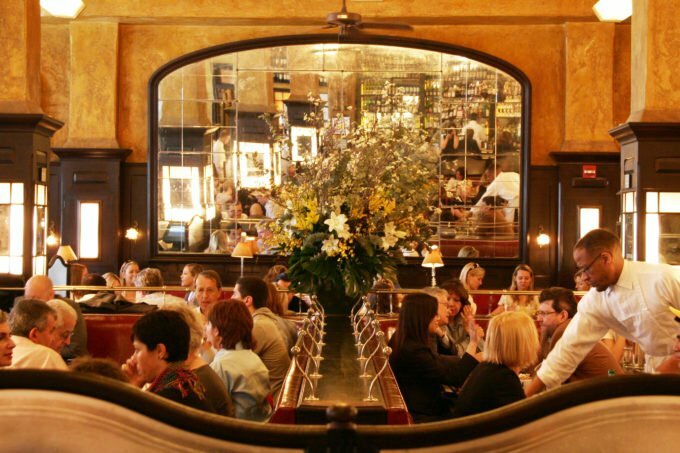 Insider tip: Try going after dinnertime to beat the tourist crowds, and grab a swanky cocktail afterward at the Upper East Side’s Bemelman’s Bar. Watch small model trains zip around a display of more than 150 quintessential New York landmarks (Statue of Liberty, Brooklyn Bridge, etc. ), all made out of natural, fragrant materials from the gardens. 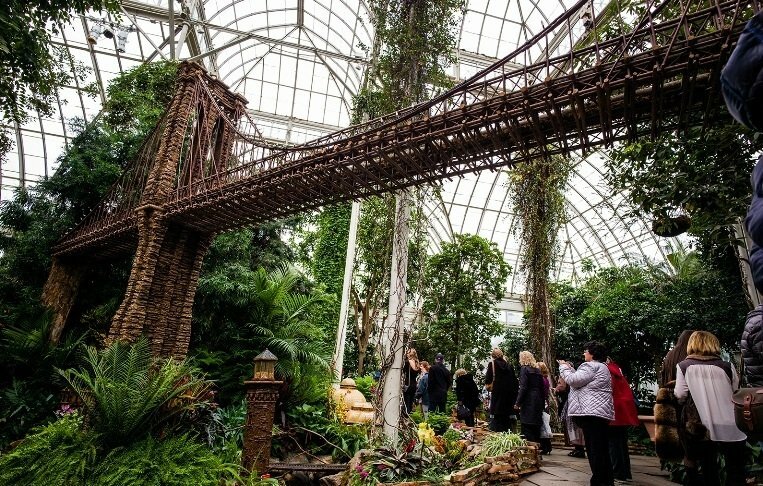 Insider tip: The Botanical Garden’s holiday cafe has an awesome old-school bake sale vibe (fresh brownies, cookies and fudge); or for a bigger adventure head to Arthur Avenue, the Little Italy of the Bronx, for eggplant parm or Sicilian pizza. Rockefeller Center’s rink may be iconic, but it’s seriously crowded. 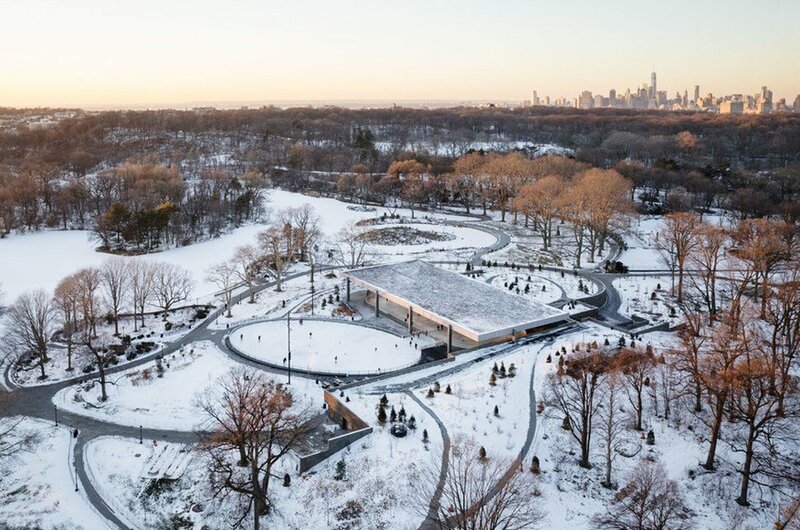 Instead, escape to the LeFrak Center in Prospect Park, where you’ll be surrounded by tall swaying trees. The skate rentals are also less expensive and less battered! Insider tip: Keep an eye out for the local curling team; they sometimes nab a corner to practice for a meet. Did you know that in Central Park’s early years, winter was its most popular season? 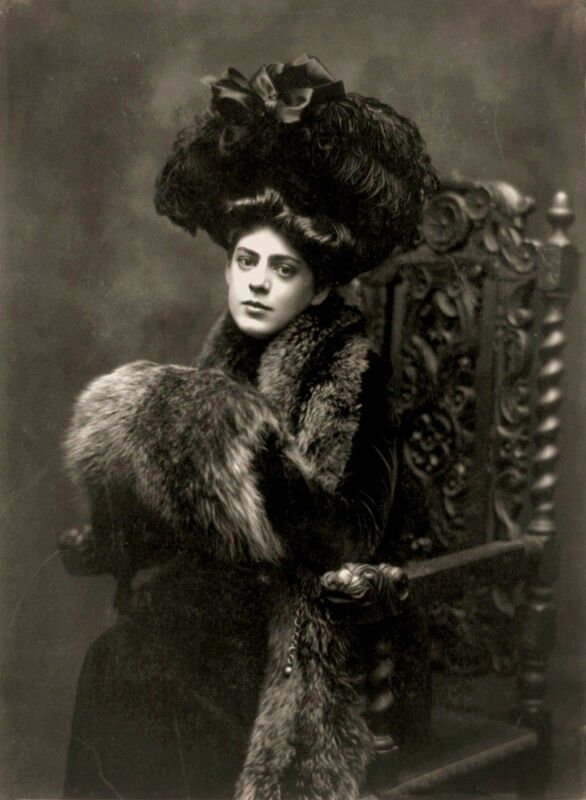 Perhaps 19th Century New Yorkers were a hardier bunch, or maybe it’s just because they wore these cozy things. A good route for a cold weather walk is starting at The Mall, a promenade running from 66th to 72nd Streets on the East Side with a canopy of elm trees, then passing by the Bethesda Terrace and the Fountain en route over to the West Side. Insider tip: Check out a show at the Swedish Cottage Marionette Theatre, inside a quaint little house near the West 79th Street park entrance. 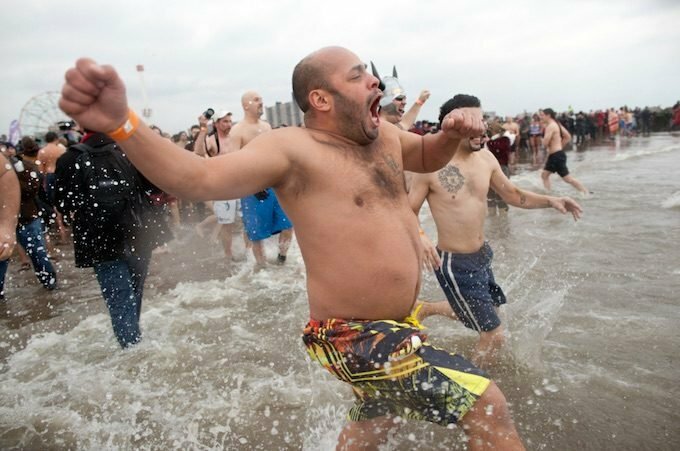 If you’ll be in town for New Year’s Day, head out to Coney Island for the fabled freezing dip in the Atlantic Ocean with hundreds of other brave souls, many of whom will be wearing costumes or funny hats. Insider tip: We don’t have one. We have never done this because we are wusses! Good luck! One of the most exciting neighborhood events in New York is the firecracker ceremony (plus magical dragon mask performances, elaborate floats, live music and a parade) that happens on the first day of the Lunar New Year on the streets of Chinatown, on East Broadway, Canal and Mott Streets, culminating in Sara Roosevelt Park. 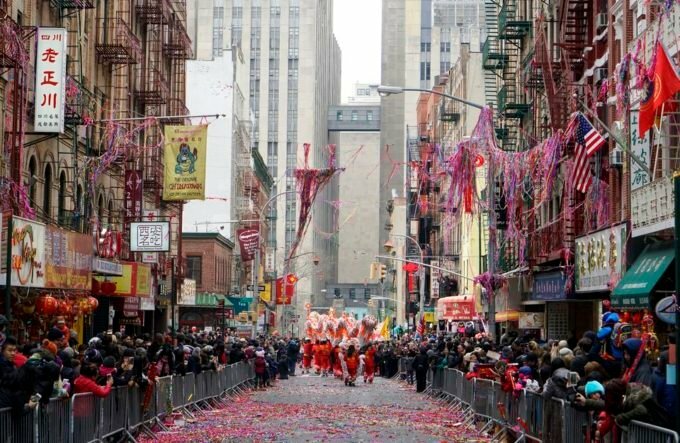 Mark your calendar for February 16, 2018, and prepare to ring in the Year of the Dog. Insider tip: Practice wishing people a happy new year in Chinese. 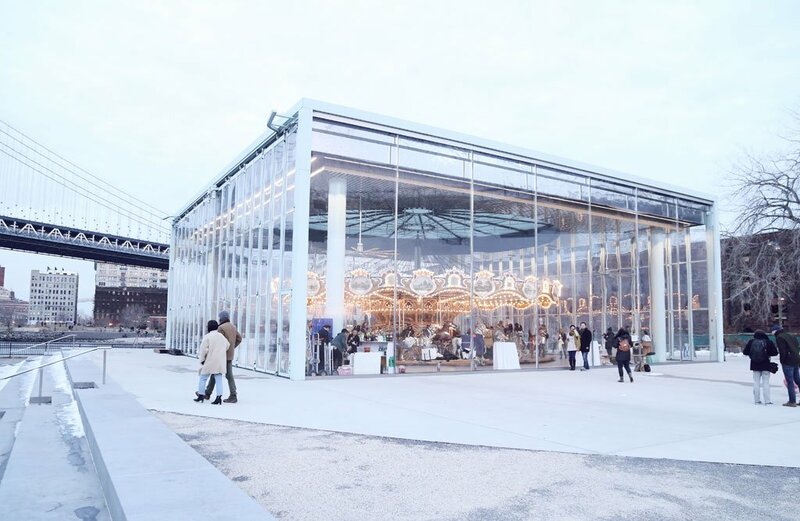 There is something so romantic about Jane’s Carousel in Dumbo (those views of the Manhattan skyline! ), and while it’s windy and cold on the waterfront, the Carousel is covered and heated. Insider tip: Get a chocolate whoopie pie and steaming cup of tea at One Girl Cookies afterward. 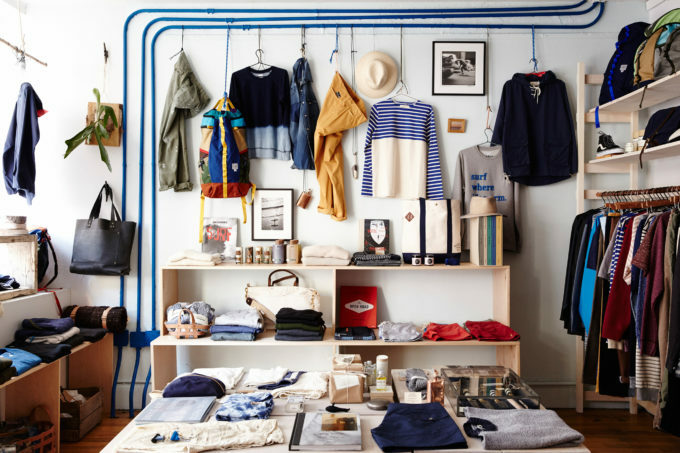 New York City has eight million awesome stores, and it can be overwhelming. 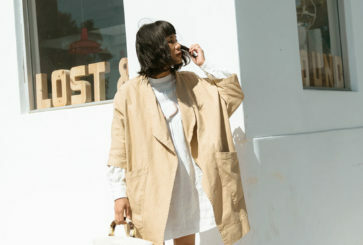 One of the nicest ways to shop is to just wander. If you have a free afternoon, we’d suggest exploring Nolita (SoHo’s more indie cousin). Start at McNally Jackson bookstore, and walk east on Prince Street before turning north or south on Elizabeth Street to stroll by cute cafés and boutiques. Don’t miss Cup of Jo favorites Clare V. (leather goods), Sézane (clothing), Everlane (their very first store, which just opened) and Erica Weiner (jewelry). We also enjoy Oroboro, Warm and Sigerson Morrison. Insider tip: Snap a photo at one of the neighborhood’s colorful murals, like the Love Wall by James Goldcrown at 192 Mott Street. Balthazar, Soho’s famous, bustling, never-gets-old French brasserie, anytime of day or night; Kiki’s Greek Tavern in Chinatown, where incredible food is served in an old paper shop that feels like a secret haunt; the Golden Unicorn, a Chinatown spot with the best dim sum and piggy buns for kids’ dessert; or the elegant Maialino in Gramercy Park for an epic cacio e pepe pasta dinner — or for breakfast, as a scrambled egg dish. Insider tip: Pair any of these meals with a mani or pedi at Tenoverten. You can book online, and their multiple Manhattan locations have you covered. 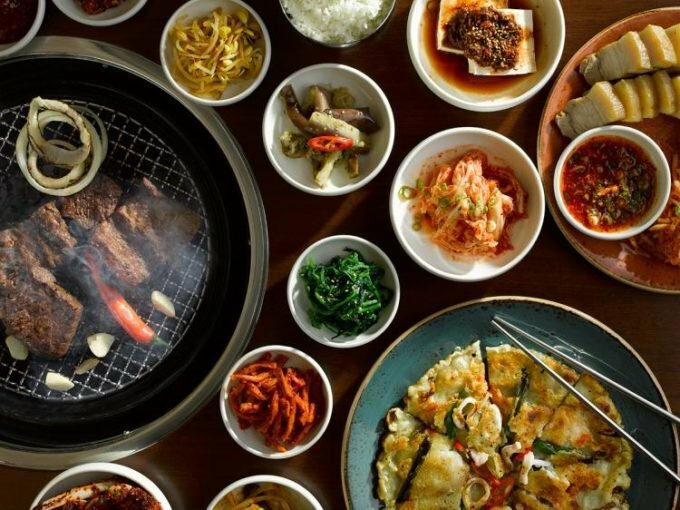 Insa for Korean BBQ in a beautiful Gowanus space (with karaoke! ); Frankies Spuntino 457, the coziest Italian spot in Carroll Gardens (order the cavatelli); Roberta’s, no-joke pizza in Bushwick that’s worth the wait; or Williamsburg’s Diner, for a killer burger with homemade ketchup in a 1950s metal (you guessed it) diner. Insider tip: Book an appointment for a warm steam at cityWell, the coolest co-ed spa in Brooklyn. Or, if kids are in tow, let them get their wiggles out at Recess. 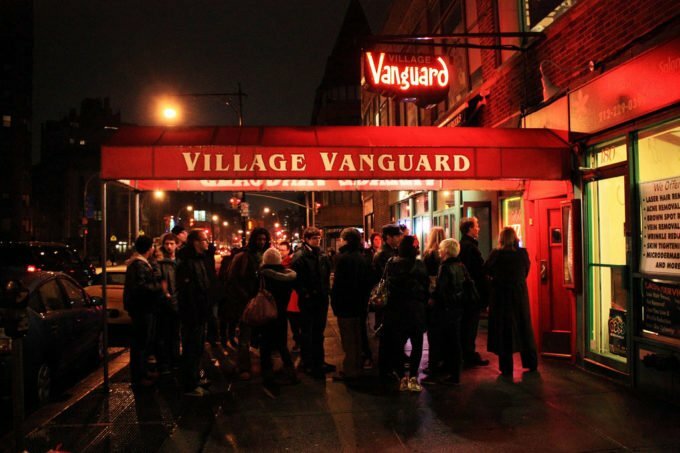 Since 1935, the Village Vanguard has been one of the most popular places to see live jazz in New York, and with good reason: it books the best performers and has a perfect basement speakeasy vibe, especially on a chilly evening. Insider tip: Put your name and phone number in at The Spotted Pig restaurant, around the corner, for their Devils on Horseback (warm Medjool dates wrapped with bacon) after the show. A few slam-dunk choices: The Moth, Mortified or the Upright Citizens Brigade’s Sunday evening improv show, ASSSSCAT, which was founded by Amy Poehler and regularly features comedy heavyweights from 30 Rock, Parks and Recreation and SNL. It’s so hilarious, the audience often sheds tears of laughter. Insider tip: UCB is closed temporarily while they move into a new theater, but the schedule should be back on track shortly. It’s worth the wait! Seeing an award-winning play or musical surrounded by other enthralled humans is a balm for the soul. We recommend Dear Evan Hansen, Come From Away and Once on This Island — or consider the New York Times critics’ picks. Insider tip: Check Broadway for Broke People for advice on the best ticket deals. “I saw a major Broadway show for $27 this past weekend,” raves our friend Matt. There’s basically a New York museum to match any interest (oh, hey, Museum of the American Gangster). But our all-time favorites are: The Met (UES), a classic, of course; the Whitney Museum (West Village), in a gorgeous new building with one of the world’s best collections of contemporary American art; the Museum of Natural History (UWS), with its giant blue whale and a planetarium show that’s not to be missed; and the Tenement Museum (LES), which gives you a gripping window into New York history. Insider Tip: If you have little dudes, our kids love Children’s Museum of the Arts, which is super bright and cheery on a winter day. What would you add? We’d love to hear your recommendations. Maybe winter isn’t the total worst! P.S. 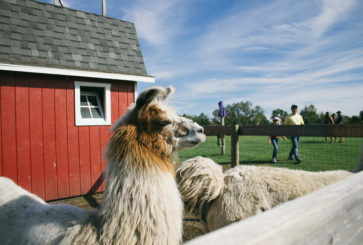 Toby and Anton’s NYC guide for kids. We always take our boys to Walter DeMaria’s “Broken Kilometer” and “Earth Room” during January when we sometimes do not want to leave the apartment. Both are free and a few blocks apart in Soho, so an easy walk. 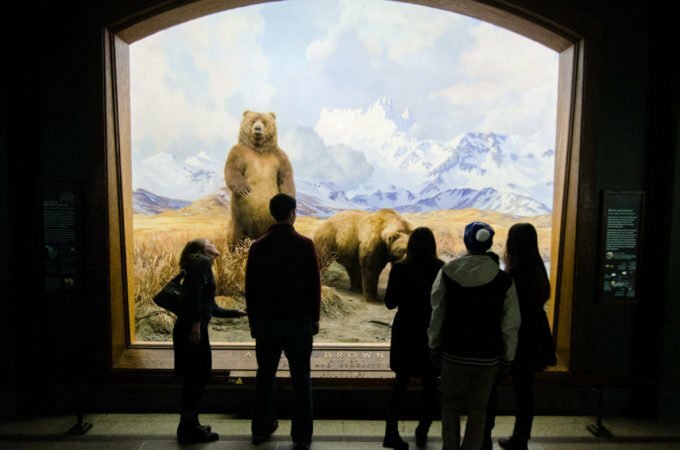 Both are also a quick visit, but they have both been permanently on public view through the Dia Art Foundation since 1979 and 1980 and lead to lots of conversations about the neighborhood and artists and the city. Both are incredible in terms of execution and concept (and maintenance! ), but we also love how hidden and quiet they always are in the middle of Soho. We are usually the only ones there and I think the boys look forward to it. Afterwards we get snacks and go to a park nearby or a movie at Film Forum or IFC — both have great kids weekend movies. I like your suggestions! We’re looking for similar things to do/see in mid-February. Anything interesting on your radar for that time period? Any restaurant suggestions? I grew up in NY but now live elsewhere, so city visits are very comforting for me, although I know other folks can find it overwhelming. I was JUST in NY this weekend, and unknowingly did several of these list items! My mani-pedi at tenoverten was particularly blissful. I spent much of my weekend curled up on the couch with family, and the weather was perfect for it. I know this sounds odd, but honestly one of my favorite winter things in NY is navigating public transit. It takes a particular personality type to find this soothing, I realize. But if you’re not stressing about a specific timetable (like your commute, trying to catch a flight, a show or a dinner reservation) the subway can be so meditative. I think that building in subway travel time, and approaching it with the mindset that it’s part of the trip, not something you have to get through, can turn it into a highlight. Stepped off the train yesterday after a great weekend from in NYC. We loved sipping hot cocoa in Bryant Park (also thelittle tent shops and skating rink), grabbing great cocktails at Lantern’s Keep in the Iroquois Hotel, taking in a high-tea and Carole King’s ‘Beautiful’ was delightful. As my friends shared, we can’t believe we were feeling so much seasonal love in the area just yesterday-saddened doesn’t begin to describe how another act of violence made us feel. -keep those phones charged, now’s the time to dust-off that portable charger you probably rarely use. -make a note of what coats/hats everyone is wearing, makes it far easier to find in the crowd (we all had the same ribbons on our zippers!). -it never hurts to have a time/spot to meet with so many great store distractions, changing walk signs, etc. I would add seeing one of the giant Menorah lightings ( there’s one in Brooklyn and Manhattan) and the Holiday Train Show at Grand Central Terminal. I booked a trip to NYC in March this year past – I was expecting cold but do-able weather… yeah, it was -7 degrees most days! One of the best things we did was book a pay-what-you-like food walking tour around Lower East Side (where we were staying). It sounded ridiculous at the time, but we basically ran from delicious steaming food stop, to delicious steaming food stop. 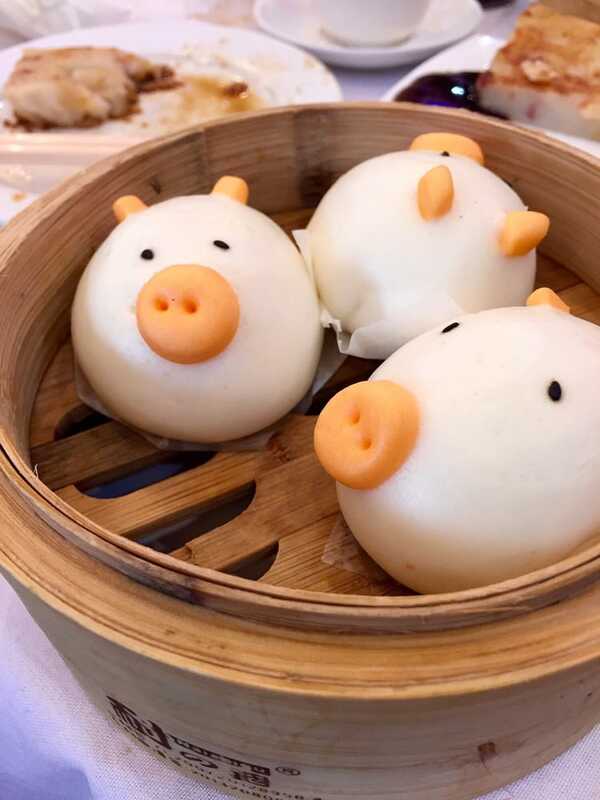 It helped us find the closest and tastiest food near us, which was an excellent motivator to leave our cosy beds, and gave us somewhere reliable to eat on our way home late, with cold feet and grumbling tummies! Awesome! For the Jazz soaking, I would also recommend Small’s in West Village. Oh my goodness, all of these are so great!! I’m going to try to make it to the lights and the carousel, but I think I really need to get over to ASSSSSCAT for a few laughs. I LOVVEEEE getting high tea at Tea & Sympathy in Greenwich Village, especially when you’ve been walking around in the cold. Hot tea, scones and finger sandwiches make me so happy! Thank you for these tips!! My daughter and I want to come back and visit New York. We loved it when we visited a couple of years ago right after Christmas. This will give us more ideas for the next visit. What are some good places to stay that are not real expensive? i would recommend renting an airbnb — you can get great deals, and you’ll have more space than a tiny hotel room. the west village and upper west side are both lovely spots to stay if you’ll be in manhattan. have a great trip, lisa! I’ve been to NYC several times, but never during the holidays. I’m hoping to cross that off my bucket list next Christmas. There seems to be so much to explore and experience. This is so perfect! My fiancé and I are going this Tuesday for six days. I’ve never been to New York at Christmas, and I’m in grad school right now (it’s finals week) and he’d been asking me what I wanted to do while we were there. I just sent him this whole list. Nearby food options for every activity? Ugh you totally get me. Thank you! I have to add the Daryl Roth Theater has an amazing show on right now called In & Of Itself that is incredible (adults only). It was an amazing interactive experience that mixes magic and stage performance. My sister-in-law and I are visiting in February and this is so helpful. Any suggestions on getting some nice views of the City without paying for a ticket? I heard the Natural History Museum has a rooftop? Perhaps it will be closed during winter, but not sure. The Met has a rooftop, not sure about the AMNH. Also the Roosevelt Island tram can be a fun way to get an aerial view of the city (you can use your metro card to get on). The Marriott Marquis in Times Square has a revolving restaurant called “The View.” There is a one drink minimum to enter and if it’s not busy you can stay as long as you’d like. The food is gross, but the view is well worth a $12(?) cocktail. I also second the tram! Also, the East River Ferry is $2.50 per person and takes you under all the Brooklyn, Manhattan, and Williamsburg Bridges and give you wonderful views of Manhattan and Brooklyn along the waterfront. It goes from Wall Street to 34th Street and makes stops in Brooklyn and Queens along the way. Gantry Park Plaza in Long Island City, Queens (just a few train stops away from Manhattan) gives a fantastic view of the whole skyline, as well as Brooklyn Bridge Park. I live on Elizabeth and Houston, so luckily (or…not so luckily for my wallet) I get to walk that shopping block every day. It’s my favorite. They just opened up a Cuyana popup shop for the season on Elizabeth St. as well. I was gifted my first tote from there a few months ago – love their stuff and so exited to see this store show up in my neighborhood! 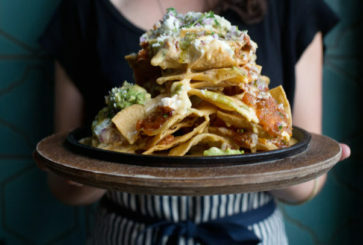 I just want to attest to the food at Tanoreen – I lived in Bay Ridge back when it was a take-out place down the block, and was so happy when they opened up the restaurant on my street! Now that we live in NJ, we actually go back every few months to eat there. The lamb fetti is the THE BEST. If you can’t get a reservation, Rawia’s cookbook is not a bad second (and makes a great gift)! Yes to the Brussel sprouts!! Rawa comes out to greet the patrons as well. There’s so many delicious Syrian and Lebanese restaurants in that area, it’s worth the long R train ride from Queens! So obsessed with Tanoreen! Lamb everything please. Have spent a few New Year’s Eve dinners there which has been very nice too! Macy’s! The wooden escalator ride to see Santa is worth the hordes of people. Plus, now they take reservations to visit Santa so maybe the wait won’t be as long. Truly magical. Can anyone suggest some good places to see local live music (that aren’t in Brooklyn)? We’ll be staying in Manhattan just before Christmas and after visiting the Christmas markets and seeing the sites, we’d love to listen to some music while we have a couple drinks. Many thanks!! Without knowing what exactly you’re into, there’s Rockwood Music Hall- a venue with several stages and different vibes, Mercury Lounge is a small club where you can see big acts or local sounds depending on the night, the Blue Note is a popular jazz spot, Pinks is a dive bar with a band in the corner, The Living Room is similar, Le Poisson Rouge has lots of eclectic performances. Enjoy! also Dizzy’s Club! It’s a small jazz club inside of the Jazz at Lincoln Center venue. There are live sets almost every evening, and late night sessions (on tues-sun) that feature emerging artists. The club itself has panoramic views of the Manhattan skyline, cocktails and food options. Cafe vivaldi in West Village. No cover. Great food and music. The cover photo is so apt. 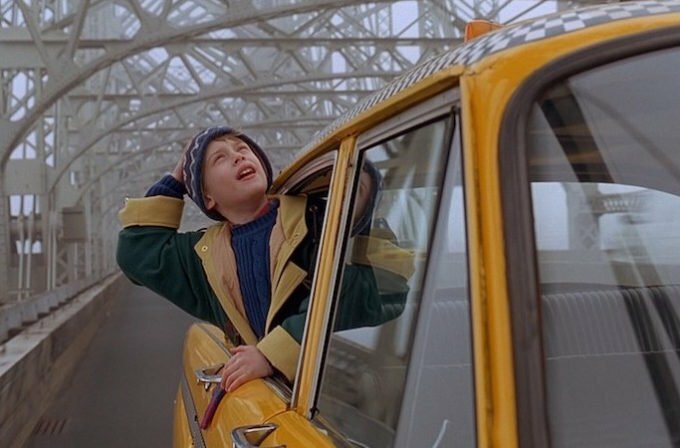 I’ve never been to NY but it’s always been a dream to go, specifically during the Christmas season, BECAUSE of Home Alone 2. :) maybe some day! What a lovely list! Quick question, which shop is the featured photo under “Best Neighborhoods for Shopping”? Thanks so much! Important question! I audibly gasped and immediately wanted to live in there. We are going to Dyker Heights to see the lights tomorrow. It’s supposed to snow so I’m thrilled! I just got a tip from a friend and she said not drive because parking is so bad. We’re going to take an uber instead! Alice’s Tea Cup! https://alicesteacup.com/ there’s a few locations (the og one on 73rd is my favorite) and you can do a really sweet tea complete with scones, mini sandwiches, etc. feels very fancy and fun. Serendipity http://www.serendipity3.com/ is always a fave too but much more touristy and crowded, typically. Depending on your tween, Ellen’s Stardust Diner is a fave too, the wait staff performs as they serve you. http://ellensstardustdiner.com/ Museum of the Moving Image in Queens is small enough that you can do it in a day and features some nostalgic faves that tweens would be into. Have fun! 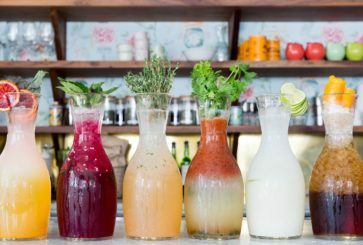 For post-NoLita shopping: Lovely Day is a cozy, Thai-ish restaurant that I absolutely love. The food is always fresh and served steaming hot (I’m particular about this :), and the prices are jaw-droppingly reasonable! Walking through the holiday markets at Bryant Park is fun too. We love the Holiday Train Show.. we are going on Sunday. 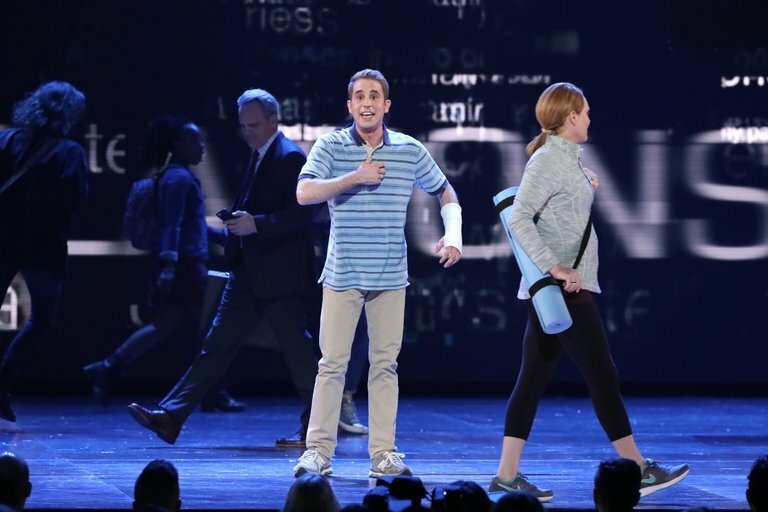 I want to go see Dear Evan Hansen.. hoping to go see it for my birthday weekend in February. 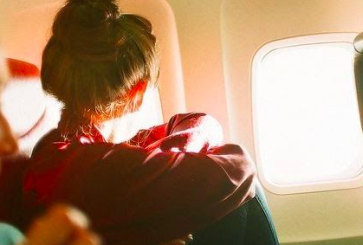 Looking at tickets right now after reading through this list and suddenly missing New York… anytime of year is the perfect time of year for NYC! If you guys like beautiful bookish places, I recommend checking out the Morgan Library Museum next time you visit. It’s so lovely. YES! The Morgan is amazing! There’s also a really cute alley of mews along the way–historic Sniffen Court on 36th Street! For a lovely winter date that will fill you and your significant other with love and appreciation, see “Hundred Days” at the New York Theater Workshop in the E Village. It’s amazing! December 14th, consider the Hip Hip Nutcracker up in the Heights, it’s extraordinary! Just Googled this and it looks so fun! Thanks for the tip. This is making me want to pack a bag and spend a while in NYC. I’ve never been, but I feel like it’s my kind of city with amazing food and coffee and culture. I’m in the airport right now on my way to NYC. Thanks!! Such good timing! Thanks Joanna! 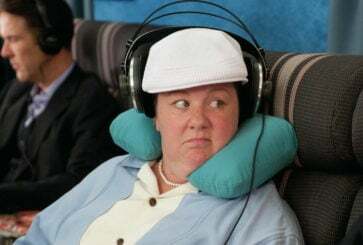 I’m headed to Brooklyn from DC tonight for a weekend with friends, we’re doing SantaCon tomorrow (no idea what I’m getting myself into!) and intend to spend Sunday soaking up the festive cheer at Rockefeller, 5th Ave, and Bryant Park market! Go see the Hard Nut at BAM!!! The Mark Morris Dance Group’s ‘retro-modern’ interpretation of the Nutcracker. It’s so good!! Also, I absolutely love walking through parks in the winter. Without all the leaves, you notice so many new vantage points, and the vibes are just so different than during the warmer months. Prospect Park, Van Cortlandt Park, Fort Tryon, Inwood Hill and the North Woods in Central Park are some of my faves. You’d be surprised at how forest-y and secluded they can feel. Thanks so much for this! Just moved to Brooklyn in July and am excited for my first holiday season in the city! :) Any NYE tips for those who’d rather die than go to Times Square? Also, to add to the indoor museums list, I thought the New York Transit Museum in downtown Brooklyn was cool. It’s kind of 1-hour cool vs. 4-hours cool (not a full day thing by any means but it’s only $10). It was interesting to learn about how the subways were built and the highlight is walking through all the old train cars and looking at the old ads! For NYE go to/throw a party! 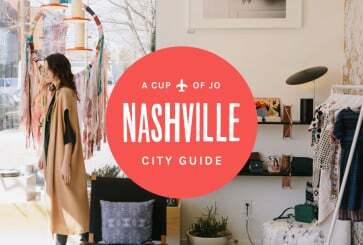 Cup of Jo has given me endless tips for tiny apartment parties- I used to throw a NYE party every year with grilled cheese and champagne. If you’re totally new and don’t know a lot of people, go to your local bar and ask what they’re doing that night. Most neighborhood spots don’t charge a cover, get packed with locals, and offer a free champagne toast at midnight- plus it will be a short walk home in heels. Also, follow your local bars on twitter- they almost always advertise holiday events. Fireworks in Prospect Park in Brooklyn is a lovely alternative to the craziness of Times Square. Love this list! I am a New Yorker and didnt know about some of these things! Definitely want to check out Dyker Heights! My husband and I moved from NYC to Vermont 6 years ago. This makes me miss the city sooo much. We were in New York for New Year and just loved the galleries! Have to say the Frick was everyone’s favourite, wonderful art and the building was stunning. Of course the Met was wonderful and the Neue Gallery and lunch was also perfect. The other great thing about this area was the coffee at Bluestone Lane, just perfect for Aussies missing their coffee fix . A great city for art and museums. Not a sponsored post! This makes me want to sob. We moved out of NYC last year after living in Manhattan for ten years and my heart aches for the city during the holiday’s. Thank you, thank you! My husband and I are taking our first trip to NYC in a week and a half, and this guide is so helpful. We are seeing the Nutcracker, and I’m so excited I could just cry. I wish I could go to NY in the Christmas season! *_* What a dream! I used to live in New York and this post is giving me ALL THE FEELS. I loved it there and had to leave sooner than I was ready to (couldn’t find work) so I’m really hoping to move back some day. I live in Europe and I’ve never much complained about the way things are done here re: Christmas and New Year’s, but this year, your article made me long for a Christmas in New York so that I could experience at least some of the wonderful ideas you propose! I particularly loved the carousel, my daughter would go crazy! I can’t wait for the festive season to *really* begin …!! Wonderful, thank you for this!! 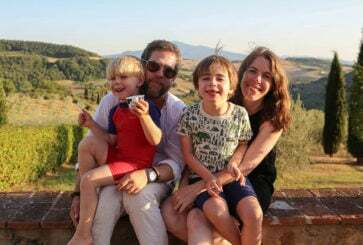 My family is moving to Tribeca in a couple months from France and I have been searching high and low for things to do with our little girls in the cold winter without friends yet for playdates (shoutout to any lower Manhattan mommies with kids who want playdates!!!!) I love this list! I’m a mama in Tribeca and my girls are learning French! Would love a play date to welcome you to the neighborhood! My girls are 7 yr, 4 yr and 21 months. Not sure how old your girls are but two activities mentioned above (Jane’s Carousel and the Children’s Museum of Arts) are nearby. There’s also ice skating at Brookfield Place and the Seaglass Carousel at Battery Park. JC – my girls are 3.5 and almost 2! I would absolutely LOVE to meet up once we’re moved in! We’ll actually be in town next week and then nearly Jan getting our place settled! If you find me on facebook under Colleen Dornquast, I would just love to connect with you and your kids! This is such an amazing and insightful post!! Hopefully me and my soon to be husband will be spending next year, our first year as husband and wife in NYC. I am sooo excited and I will be using this guide for sure! 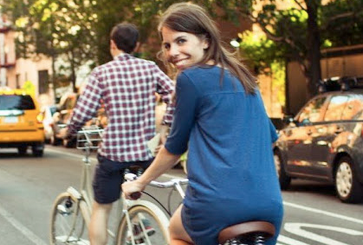 This guide makes me miss living in New York so much! Some fantastic recommendations here. I’d like to add to the list of Extra Cosy Restaurants in Brooklyn, especially well-decorated during the holidays. Amazing timing! I just got to Brooklyn for a quick trip with girlfriends and we were looking for some additional tips/recs, especially holiday related. Thanks, Joanna! For cozy Brooklyn dinner: Black Mountain Wine House. It has a fireplace! Also, you can walk to Ample Hills from there for the best ice cream, and there’s never a line in winter (and the ice cream is still just as delicious). This is one of my favorite places! It’s an amazingly cozy space and their food is soul-warming too. And they do amazing desserts. One time my husband and I went there to get their bread pudding, but by the time we ordered they were OUT. So the waitress said, “but we’re doing homemade donuts, would you like that instead?” Um, YES. Like many other former New Yorkers commenting on this post, I miss it SO much. The Christmas markets! 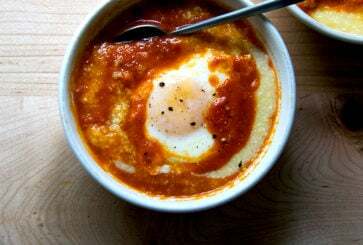 Grab some hot pierogis and borscht at Veselka to warm up afterwards. For drinks – Go to Upstate for oysters and beer or a prosecco (one of my first dates with my fiancée, in February 2015 during the polar vortex)! Super cozy and they give you whiskey cake for dessert. Or try to score cheap tickets to a hockey game at the Barclays Center and check out Black Forest (a German Beer garden with the BEST food) before the game. I just got back from New York City yesterday and am so bummed to have missed most of these! Think I can talk my husband into another long weekend, like, next week? Add Oak + Fort to your list of shopping musts. I was turned on to the boutique when I last visited in August and made sure I went again this time. Love the aesthetic!! Ugh, this just makes me really want to go to New York again, but it’s not possible for a while. This post makes me miss NYC so much. And I LOVE how the majority of the tips have a food tip to go alongside them! CBT’s annual production of The Nutcracker has become a tradition for many families and schools in the area. This year’s production features guest artists Alison Stroming and Nicholas Rose from Dance Theatre of Harlem. The following resources can provide teachers, parents, and children more information about The Nutcracker. Tickets can be purchased at the UPAC box office or via Ticketmaster. I love Tanoreen, thanks for featuring it! Some of the best Palestinian food anywhere and the owner Rabia always goes around checking on guests personally. The tahini brussel sprouts are definitely amazing and I dream about their musakhan -charred chicken on very sumac-y, caramelized onion-y flatbread- weeks after I have it. The Brooklyn Museum is a not-so-hidden gem with wonderful exhibits (and very tolerant of young kids running around). I second the recommendation for the Tenement Museum as well, it’s lovely. this (almost) makes me miss nyc in the freezing cold! 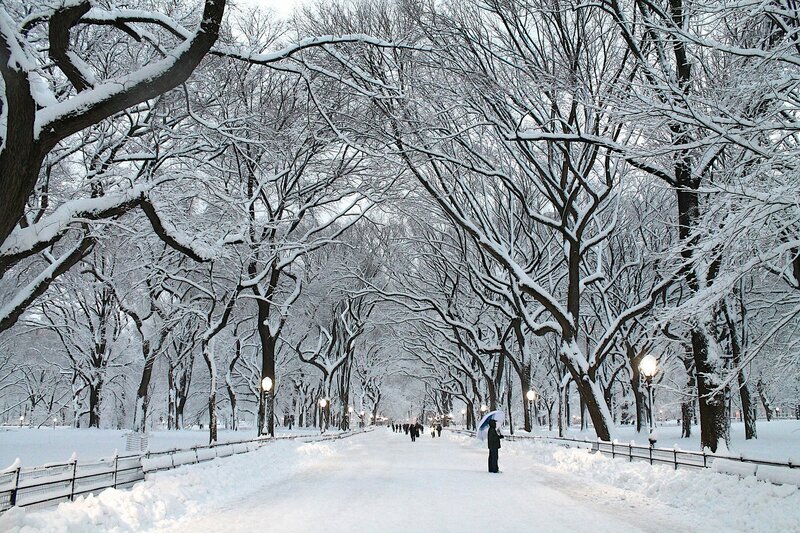 Ahh, why can’t I live in New York just for their Decembers? This amazing compilation so makes me wish I were going to be in NYC this winter. Jo: Belated thanks for something you posted one winter years ago about an exhibit at the Armory, one which featured swings that patrons could take a turn on, I think maybe in the dark, and maybe with curtains that billowed in the airflow made by the swing. Do you remember that? It sounded fantastic. At the time, I had an employee who was going to go home for the holidays to see her family in NY, and I encouraged her to check it out, and she did! She went with her sister and they loved it. So thanks again for that recommendation and to you and your team for all of these wonderful new ones. PS–the Insider Tip about the freezing plunge is funny. I don’t think I’d be brave enough either, but just the other day I heard someone mentioning that a winter dip maybe not as unbearable as one would think, since the air temperature and the water temperature are closer in the winter than they are in the summer. Still….brrr! I am headed to NYC over Christmas and New Years from Australia and cannot wait !! 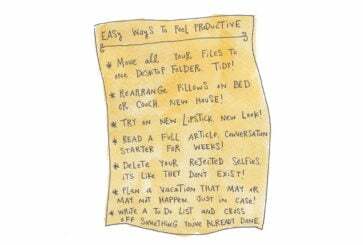 These tips are perfect timing – I plan on finishing off my todo list this weekend! I’m a Londoner with family in NYC, and one favourite winter outing a few years ago was battling through the snow to the Frick Collection – it’s a beautiful collection of art, of course, and the house (mansion!) is also stunning. It’s also kind of worth popping in for a cup of tea at the Park Ave Armory, even if there’s no art installation in the drill hall, because the room where the cafe is has the most bizarre and amazing tiling and decor. Outsider tip: say “thank you” to every slush-shoveller at intersections and enjoy their surprise! Sweet!! This post makes me want to visit NYC for a winter holiday one year! In NYC this event celebrates both, even though I think they are technically a day apart. Rolf’s! On the corner of East 22 Street and Third Avenue. They go all out on Christmas decorations (seriously, if you’re tall, you can’t even stand up since there are so many on the ceiling) and have killer egg nog. It gets super crowded at night and on weekends, but it’s manageable earlier in the evening. UCB has an East Village location! Also the Hell’s Kitchen location just opened its doors the other day! I like the Rubin Museum down in Chelsea. It features Himalayan art and is open late on Friday nights. It’s got moody lighting all around and a bar attached. Good stuff. I agree, a favorite spot! just in time…I’ll be there this weekend! thank you!